We want you to have a blast in your city this summer. Go on a treasure hunt with us. Read the rules to play along. 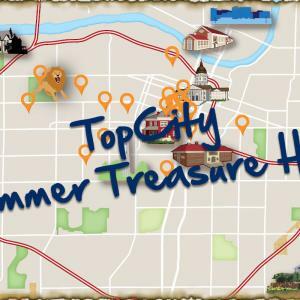 Every six places you visit and share photos, using #TopCityTreasure, gives you one chance to win. Visit all 36 places, posting photos from each, and you&apos;ll have six chances to win the grand prize. The creatures may be fake, but the fun never is. Climb on over to see the larger than life wildlife! "Drive-in" to this wonder of Kansas and eat like Guy Fieri. This is the only National Historic Site dedicated to a Supreme Court case. You can visit it for free. The owner of this eatery knew that Topeka was the place to be. They even have a "Pong Bar"! A mere 296 steps takes you to the top of Topeka. Flavors have been "popping" at this local business since 2013! The nation&apos;s 49 other houses like this are bigger, but ours has the largest public yard. This museum was home to the only U.S. Vice President who was Native American. Find the plane Maverick and Goose flew at this museum. Walk down "Main Street" to discover the place where the Free State Constitution was ratified in 1855. There are six of us here, cast in bronze, so take a photo with one from dusk to dawn. This daredevil&apos;s lucky rabbit&apos;s foot made him as famous as his jumps. If walls could talk, these would have a lot to say. They tell the colorful stories of our community. You&apos;ll find the Kansas Hall of Fame here. Find the only sweet and nutty Hill in Topeka. Sure to satisfy your chocolate desires. When the flag drops, records are broken here. This child-approved location has been helping kids discover, learn, and create since 2011! Here you can find the very first photo of a Kansas tornado, a Cheyenne tipi, and 150 other things we love about Kansas. Expedia says this place is the best in Kansas. You&apos;ll find building bricks of all sizes in the basement "Lab" of this museum. Radar, Doc and Hawkeye won&apos;t be there, but you can check out the set here. You&apos;ll find a Viking, Topeka&apos;s best cheese and some pink in this booming district. You can get a "hot bath" for 10 cents and a Green River here. Fuse it yourself at this underground shop, or choose a "Prairie" creation to take home. It&apos;s not a train station, but this early Topeka home was a stop on the Underground Railroad. If you&apos;re nuts for sweets but can&apos;t eat nuts, this bakery has a recipe for you. It&apos;s not in a blue box, but you can admire Louis&apos; fancy glass here. The oldest place in Topeka where you can "rest"…in peace. This former school is the nation&apos;s oldest continually running dinner theatre. We&apos;re red or blue and can ride all over! Taylor Swift said "Shake it off," this ____ of the year wants you to "Check it out." Lions, tigers and bears are among more than 200 residents here. You can jump for joy when you arrive. Don&apos;t forget to eat before you leave! On the east side of town, you&apos;ll find trucks that stand. You can find me around town, but my favorite place is 17th Street, where students tell me I have a nice "bod". This restaurant shares its name with a founder of Topeka. When you&apos;re finished, stop in at the Visitor Center to open the Top City Treasure Chest for a free gift.